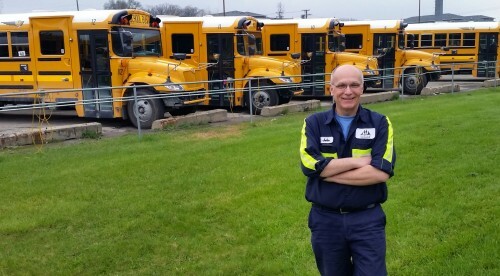 A year ago, AAPS’ bus fleet manager John Nikolich was spending an awful lot of time overseeing the repair of aging, rusting buses. Then the voters stepped in last May and approved a bond proposal that allowed AAPS to sell $33 million worth of bonds to fund capital improvements. John Nikolich is feeling a whole lot better these days about the fleet. Today Nikolich feels a whole lot better about the condition of the AAPS fleet, which now includes 23 brand new buses. “The reason we’re all happy is because the district now has a plan to replace the aging bus fleet, which will ensure the safety of our students,” said Nikolich, referring to the five-year replacement schedule that will introduce 23 new buses each of those years. The AAPS School Board in June approved the $2.3 million dollar purchase of 15 71-passenger general education buses, six special education buses with lifts, and two buses equipped with integrated child seats that can accommodate children of all sizes, allowing greater route efficiency. The new buses were put into service in late December. And while most people probably can’t tell the new buses from the old ones at a casual glance, Nikolich said the difference is apparent to the drivers, who like them because they’re new and ride nicely, with quiet engines. There are 119 buses in the district’s entire fleet. Excluding the latest additions, the newest buses in the fleet will be seven years old at the end of this school year. Superintendent Jeanice Swift said AAPS is fortunate to have skilled and conscientious mechanics and technicians who care for the buses and keep them in good repair over a number of years. ” We are also grateful for the voters in Ann Arbor who understand and support the need to invest in replacing and updating equipment that is critical to providing accessible and safe transportation for our students,” she said.